Eimear began playing the oboe with a local concert band when she was 7. Two years later she was accepted into DIT Conservatory of Music, where she was awarded scholarships and completed the Foundation Music Course with distinction. She continued her studies at London’s Guildhall School of Music and Drama, where she won an award from the Sir John Barbirolli Foundation. On graduating in 2007 Eimear won the Deutsche Bank ‘Pyramid award’ which recognises entrepreneurship in Arts graduates. This allowed her to set up her own business, ‘Oboe Reeds Direct’, which aims to make the oboe more accessible by providing low cost, consistent reeds. The business continues to grow and supplies oboists around the globe. Since returning to Dublin, Eimear’s work has been diverse; everything from having an historical article published to playing with De Danann in China. Her main focus is now on education, with a special interest in the earliest stages of music making. 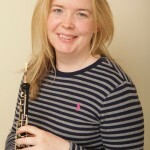 This interest has seen her introduce school children around the country to making music through the National Concert Hall’s ‘Up the Tempo’ programme and she works regularly with Music Generation Wicklow, The Artane Band, Dublin Youth Orchestras, Irish Youth Wind Ensemble and Irish Association of Youth Orchestras.